My Book: Self-Empowerment: Have the Life You Want! 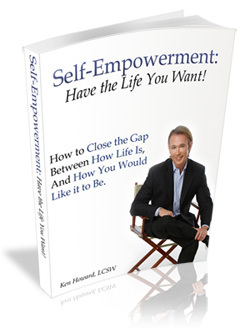 My first book, Self-Empowerment: Have the Life You Want!, is now available in hardback, paperback, and e-book formats. It is a self-help book (not gay-specific), and is a guide on how to close the gap between how life is and how you would like it to be, in important areas of your life such as your Mental Health, Health, Relationships, Career, Finances, Family, Community, and Spirituality. It’s based on stories (with identities kept confidential) from my experience as a psychotherapist and life/career coach since 1992. Please email me at Ken@GayTherapyLA.com or text/call 310-339-5778 if you have questions on how to find the book.